Pat loves her 12 foot long Gammill Optimum Plus so much that she named her “Glorious Gloria Gammill” and together they create quilting magic on your unfinished quilt tops! 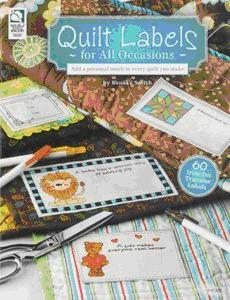 This hand guided quilting machine makes quilting easier and quicker and allows Pat to be more creative than ever. Pat’s knowledge and practice of Zentangle , along with over 30 years of experience, makes her machine quilting special and unique. Every customer quilt has its own personality. Choose from hundreds of pantographs (edge to edge), custom designs, borders or overall meandering designs. Pricing is determined by quilt size and complexity of quilting. Pat will help you choose the best method and design to compliment your quilt. Pat also offers heirloom quilting, hundreds of thread colors, batting, backing piecing services and binding services. Whether you live near or far Pat can work with you! Visit Pat’s studio for a professional consult or work via email, text and/or phone to create exactly what you desire for your quilt. Everyone loves to make quilt tops. How many do you have just waiting to be layered and quilted? . Whether you would like an old quilt top quickly quilted for utility use or a new top custom quilted, Pat can do the job. Working on a Gammill Optimum Plus Longarm Quilting Machine makes machine quilting easier and quicker and allows Pat to be more creative than ever. Choose from hundreds of pantographs (edge to edge), or custom design a prize winning quilt. Prices are determined by quilt size and complexity of quilting. Pat will help you choose the best method and designs to compliment your quilt. Pat treats every quilt with care as if it were her own……. 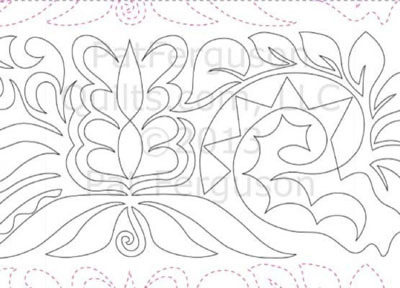 Pantograph designs are repeated “rows” of patterns that go from one edge to the other edge of your quilt. This can include all over meandering designs with many choices, from plain to fancy with swirls and curves. Custom quilts are priced individually as each one is so unique. Custom designs can include individual block designs, stitch-in-the-ditch, outlining, cross hatching, freehand quilting designs, or use of templates. Many of these include marking, measuring and centering which is more time consuming but extremely enhancing to your quilt. Heirloom quilts are also priced individually and usually include tight stippling, small background grids, feathers, trapunto, and/or dense free hand quilting designs. This type of quilting is very labor intensive as it requires a great deal of marking, measuring and accuracy. Create prize winning designs for your quilt. The amount of thread used depends on the size of your quilt and complexity of quilting. Pat carries a wide variety of colors to easily match any quilt. Each quilt gets a fresh new needle and some more densely quilted pieces may require 2 to 3 needles. Don’t have time or space to seam and square your backing? Let Pat do it for you. Generous ½” seam allowances with selvages trimmed. Half binding- Pat will make your binding, machine sew it to the front of your quilt, then trim your quilt. It will be ready for you to hand sew. 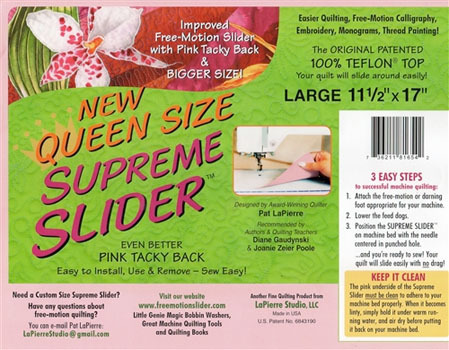 Complete Binding– Pat will make your binding, machine sew it to the front of your quilt, trim your quilt and hand sew it to the back with matching thread. Pat will “rescue” your unfinished old or new quilt top. So many quilt tops are sitting in a closet just waiting to be completed and enjoyed. Whether you just need a border added or a stack of blocks completed into a top, have it finished , layered and quilted so that you can enjoy it. Measure quilt top length & width. 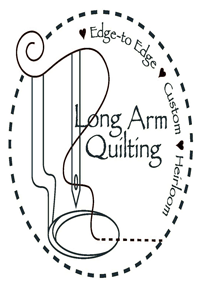 Is Your Quilt Ready for the Longarm? Subscribe to Pat's newsletter and follow her on Facebook and Pinterest!